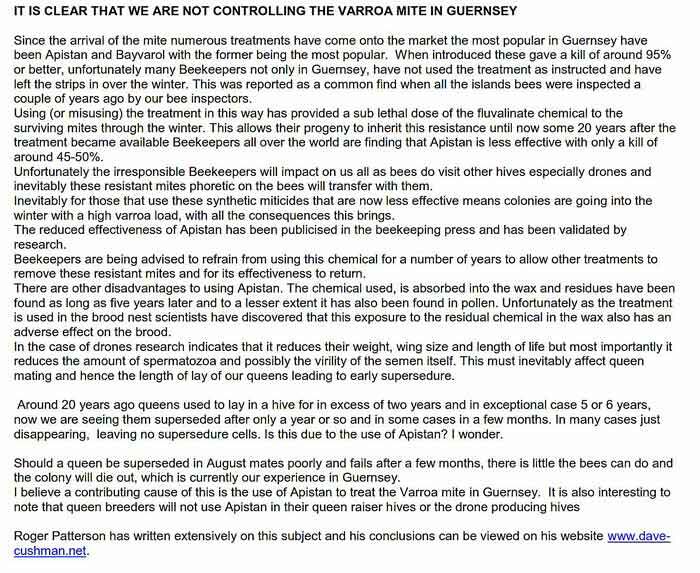 Listed here are the forthcoming events organised and undertaken by the Guernsey Beekeepers Association. (GBKA). Any other events or courses not listed here have not been organised by the GBKA. Do not worry about editing or enhancing them this will all be done here! - large images are also no problem - all we ask is that they are in focus! As some of you will know, annually each spring the association runs a course of five weeks classroom sessions and five weeks of practical sessions to introduce prospective beekeepers to the delights of keeping bees. It is purely an introduction and does not aim to turn attendees into beekeepers but as some have discovered it provides some basic knowledge, understanding and the confidence to open a hive and handle bees with experienced guidance. With the establishment of the new apiary at the GSPCA last year there is the further opportunity to meet once the course is complete on weekday evenings with other members through the summer to further build on that knowledge and experience again under experienced guidance. This year’s classroom element of the Introduction to Beekeeping course will conclude just before Easter, before the practical elements start in May. Quite a few of the associations current members whilst now having their own hive[s] have not had the opportunity to partake in the night school, as each year the course is oversubscribed. For many years whilst the association membership was nearly trebling the night school course was only run in alternate years further reducing the opportunity for new beekeepers to participate. Since we have broken away from the College of Further Education and have full control over classes the committee has decided that this year, they will extend the opportunity of attending the theory classes to all the association’s membership. These will very much be two-way class room-based sessions an element of instruction along with discussion as required where you will hopefully have any of your queries answered in addition to gaining some insight of the honeybees working life to assist you with managing your colonies. • The Colony-an insight into what goes on inside the hive and why. The sessions will be run by Chris Tomlins and each will be illustrated using a PowerPoint presentation. Enrolment will be at the Plan and Prepare gathering at Jeannine’s this Saturday. We have been invited to have a stall at this event at the Victorian Gardens at Saumarez Park. We will be selling pancakes and bee related products. If you would like to support this event please pop along as there will be a lot going on as well as our stall. Again we will be having our pancake stall to feed all the hungry people that night. We will also be selling bee related products and pens, cushions and all sorts of things. We have been asked if we would like to have a stall at this 2 day show. Last year was the first event and it was held at the Haye Du Puits in the Castel. The event was a huge success and the organisers want to make it even bigger and better this year. We will keep you informed about this and what we intend to do for this. We have a few ideas but just need to sort a few things out first. Our Honey Show will again take place at the Victorian Gardens at Saumarez Park with judges being kept busy with bee produce, photography classes and cookery classes. Please save the date. The swarming season will soon be upon us again in next few months and the committee have asked that if you have any spare clean sheets that you no longer want, could you kindly donate them to us as we use these for swarm collecting and our supplies have dwindled. Thank you very much if you can help with this. Further details on these will be given when known. We welcome visits from youth groups, and can supply children’s and adult bee suits so the children and adult leaders can get kitted out and look inside a hive, we also take our sealed observation hive to schools playschools and groups such as WI so they can see the bees, and learn about honey bees and how we keep them. 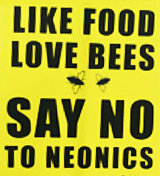 We would like as many people as possible to be Bee Aware. The girl in the picture shown below is wearing one of the bee suits. If any organisation is interested in a visit please contact us through this website. 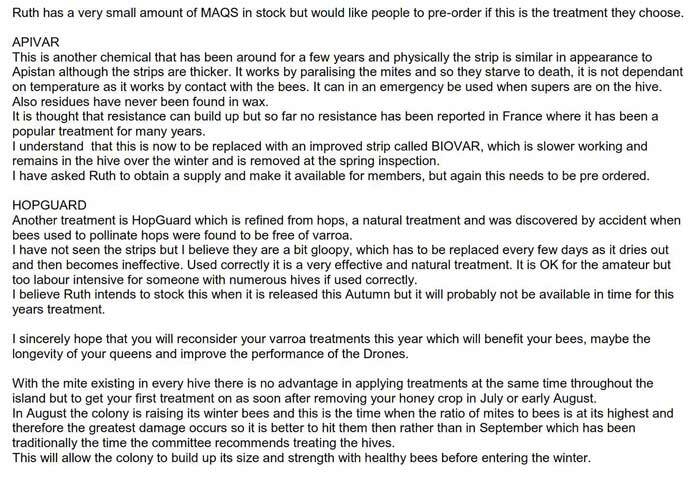 On the same site our President, Chris Tomlins has also suggested the leaflets about the effects Neonicotinoids are having on honey bees make interesting reading. 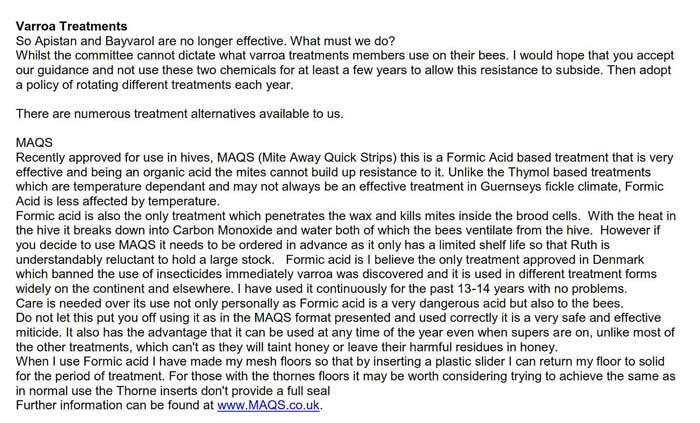 Fortunately these chemicals are not being used by farmers in Guernsey, but they are being incorporated into chemicals for home use that can be obtained from local garden suppliers. Shown here is a link to a NEW SCIENTIST article describing how honey bees are spreading disease to other insects. A study from North Carolina State University shows that when a colony is infected with a harmful fungus,honey bees ‘self medicate’ by bringing in increased amounts of antifungal plant resins. When faced with harmful fungus, bees line their hives with more propolis (a mixture of plant resins and wax that has antifungal and antibacterial properties) to help ward off the pathogens. Researchers found that when faced with a fungal threat, bees would bring in up to 45 percent more propolis on average. However, although it is widely believed that propolis also has antibacterial properties, this self medicating behaviour does not extend to bacterial threats in a hive. Honey bees did not bring in significantly more propolis when their colony was infected with pathogenic bacteria. 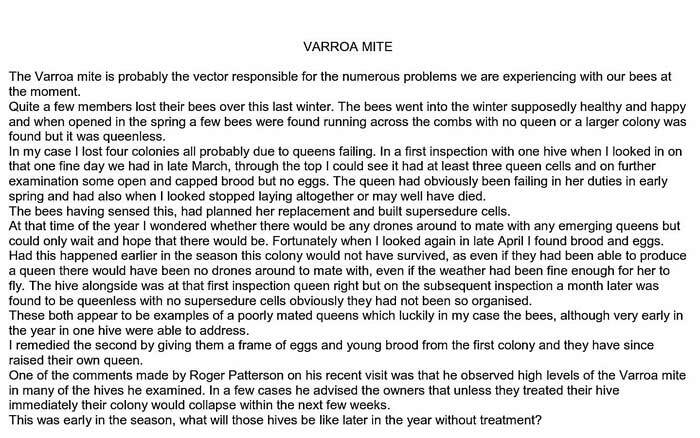 Members of the public have contacted the Association with requests for bee hives to be placed on their properties.